Explore the gallery of photos against DRM in Web standards. 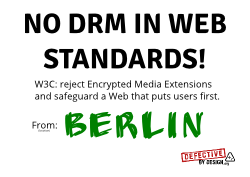 Powerful companies are are putting pressure on the World Wide Web Consortium (W3C) to enshrine DRM in the technical standards that undergird the Web. But the W3C's leadership also knows that its decisions affect people around the world, and doesn't want to be seen as ignoring Web users. 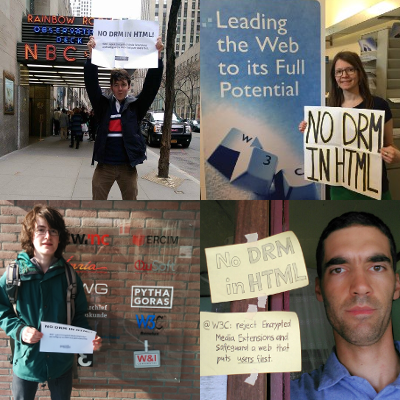 By building an international gallery of selfies (a Web-native means of expression), we show them that users of the Web everywhere say NO to DRM in Web standards. 1) Make a sign a sign protesting DRM in Web standards. Include the name of your location. Try our printable sign and fill in your location if you're not feeling creative. Try our printable sign or make your own. 2) Take a selfie with your sign in front of a landmark, distinctive local feature, or skyline. The best landmark? One of the 20 W3C offices, scattered across the world (addresses for USA's and Japan's and all others). Let us know that you would like to remain anonymous. 4) Post them on social media with the hashtag #hollyweb.